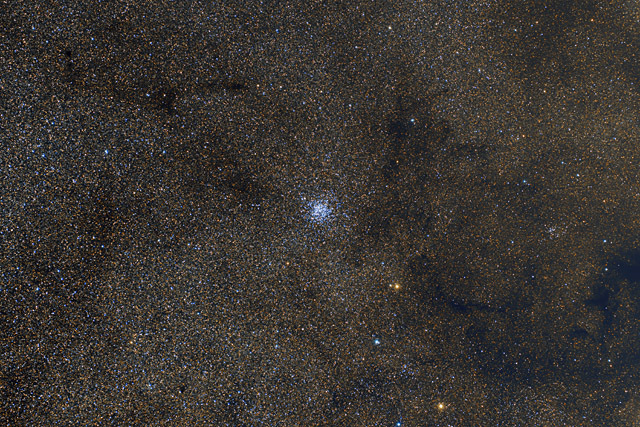 One of the richest open clusters, M11 contains about 2900 stars. The cluster earned its nickname, "the Wild Duck Cluster" in the 19th century when Admiral Smythe observed that the cluster's triangle of bright stars looked like a flock of flying ducks. These brighter and hotter stars are distinctively blue, which contrasts well with the surrounding population of stars in the Milky Way's Scutum Cloud. In this image, North is to the right. This image was cropped to 85% of the original frame. Software Used Images Plus 5.75 for camera control. Images Plus 6.0 for calibration, stacking, ArcSinH stretching, star shrinking and halo reduction, smoothing and noise reduction. Photoshop CS5 used for levels and curves, match color, lab color, and selective color. Pixinsight 1.8 for color calibration. HLVG for additional color correction, Gradient Xterminator for gradient removal. Carboni Tools for additional noise reduction and smoothing, Focus Magic for focus restoration. Registar 64 for stack alignment, color channel alignment and registering. Notes I've always found M11 to be a visually stunning cluster, but never had a chance to photograph it. Its buried in such a very dense star field, that I found managing the stars to be a tricky proposition. In the final analysis, I'm quite happy with this image, as I think I captured some very good color and have some good resolution for such a dense field. This image was published in the August 2016 issue of Sky and Telescope! !